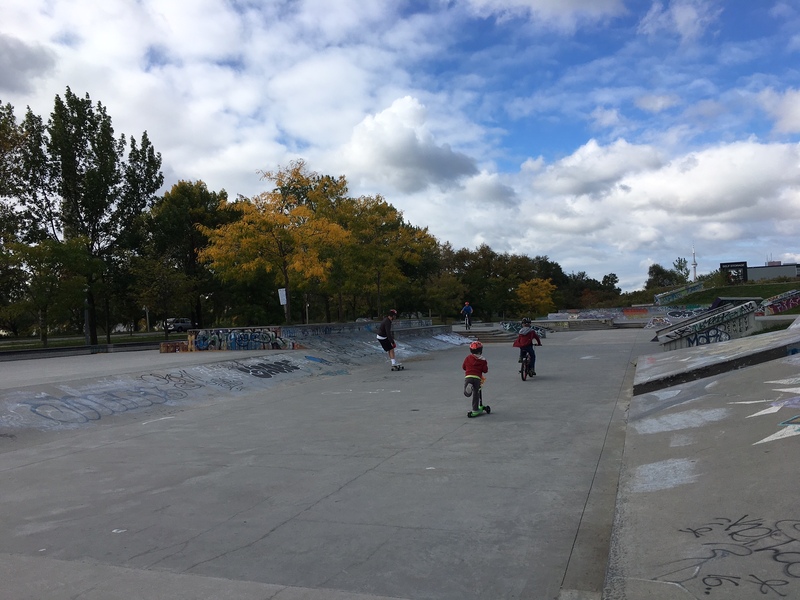 Skateparks not just for skateboards | Kids in T.O. We’ve been driving past the Beach Skatepark for years and as I do with most activities, I file it away in my head as another destination for when my kids are old enough. Well we finally made it. Except that, we don’t skateboard yet. 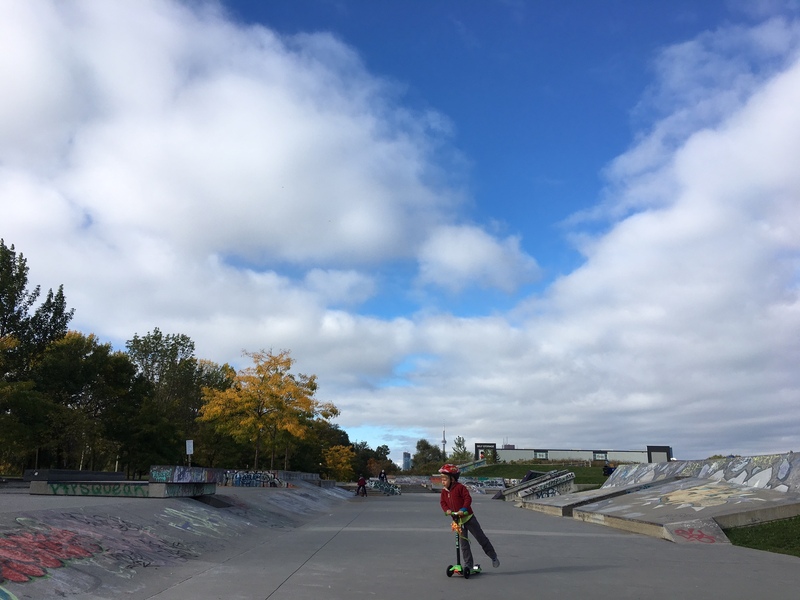 But my boys on bike and scooter have fallen head over heels (sometimes literally) over the city’s skateboard parks. 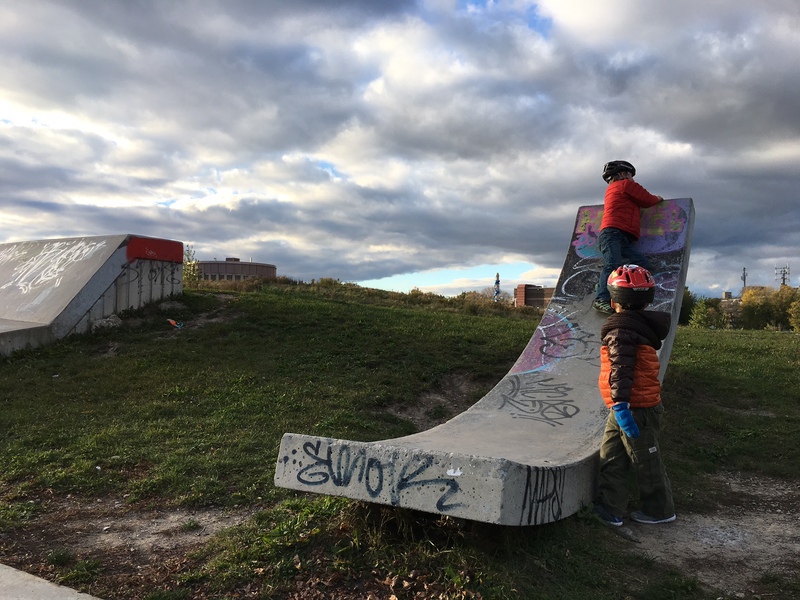 They’ve dubbed the Beach location along Lakeshore Blvd at Coxwell Ave as the “Jump Park” and it’s become their favourite new destination to play on weekends and after school. This location is one of 13 in the GTA. (Here is a map of the others.) 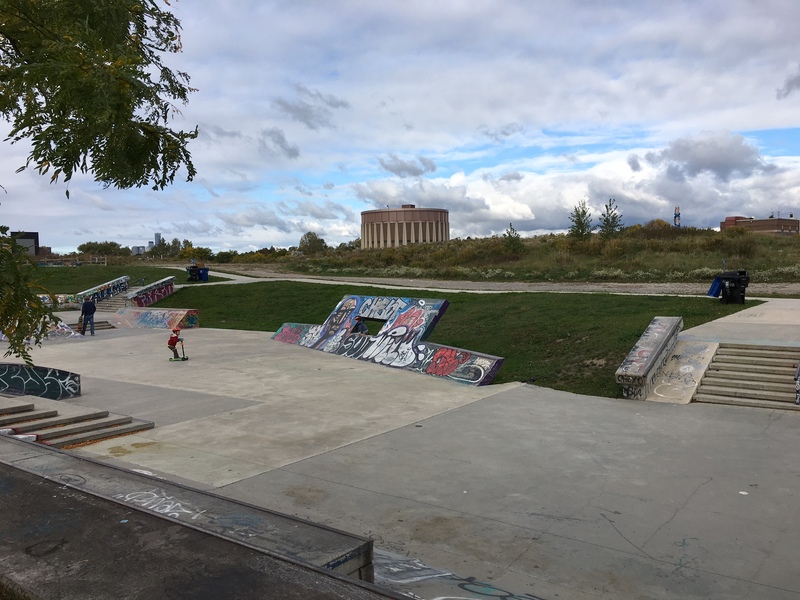 It’s the city’s only regional-scale skatepark and the largest concrete skatepark in Ontario. It is a plaza-style street skatepark with ledges, ramps, stairs and rails and a full-size pool or what they call a ‘deep kidney bowl.’ It’s 11-ft deep with no ladder or stairs access, so unless you’re into scaling walls or hoisting your kids out, best to have a peek and move on. Real skateboarders might disagree on sharing the space with two-wheelers, as I assume some slow moving kids on bikes and scooters probably annoy the pure skateboarders. That’s why, as with most family-friendly activities, we visit early (before 11 a.m.) and tend to stay on the perimeter once the bigger kids on boards show up. They are really fun to watch. 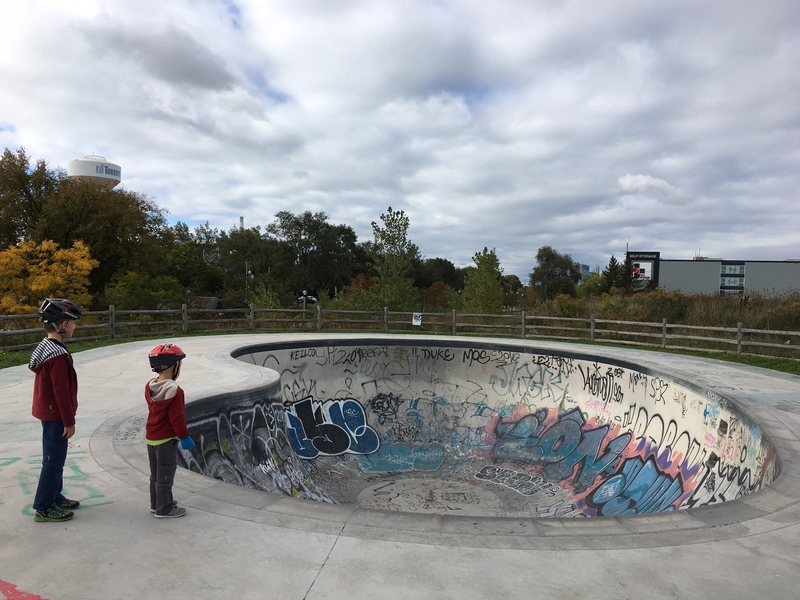 I can’t wait for my kids to move up a level and there are lots of skateboarding clubs, schools and classes (including the city-run Toronto Fun Guide programs.) 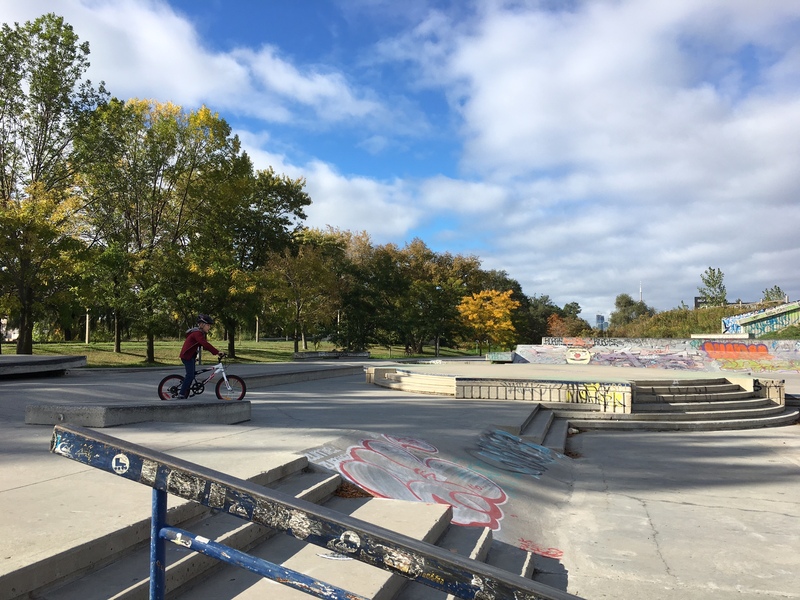 The City of Toronto has embarked on a Skateboard Strategy, so expect more to come. During the summer months, keep your eye out for the Pop-Up Skateboard Playmobile that travels to city parks. 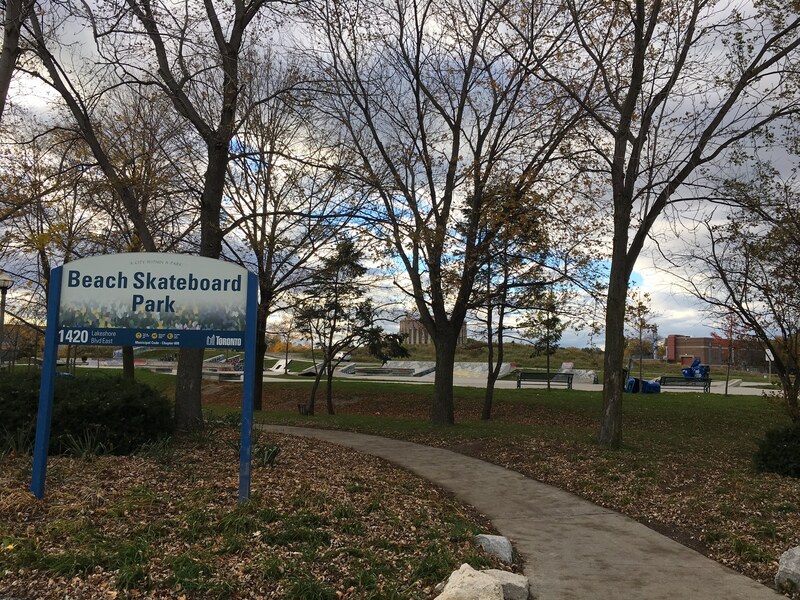 Getting there: Beach Skatepark is at 1420 Lakeshore Blvd. It is easily accessible on bike or walking as it’s along the Martin Goodman Trail. Driving you can park for free along Coxwell Ave (outside of 4-6pm on weekdays.) There is also a free parking lot southeast near Ashbridges Bay. Potty time: There are public washrooms on the east side of Coxwell in Woodbine Park. Snack time: Nothing in the area, unless you walk up to Queen St. E.
In the hood: More biking, scootering and skateboarding along the Beaches Boardwalk and The Spit. There is some geocaches in the area and the Leslieville Farmers’ Market is nearby between May and October.